① Is tired of lights and troublesome switch installations? ② The courtyard is not lit and the road is dark at night and I am worried about my family's fall? ③ Worry about animals and thief? ④ Worries about low quality? ⑤ Do not like appearance? turns off automatically during the day, and turns on upon sensing movement at night. ●1.The solar light should be installed in places with required sunshine. ●2.Before use, please turn on the switch and make sure the solar light be charged with sufficient sunlight for at least 4 hours. ●3. When the sunlight is not strong, the battery may not be paid safely, it's normal that the lighting time and brightness will compromise. So it is normal to work for shorter time in winter. ●4.Please clean the solar panel regularly to ensure the efficiency of charging. then cover the solar panel with your hands in the daytime or put it in dark environment. 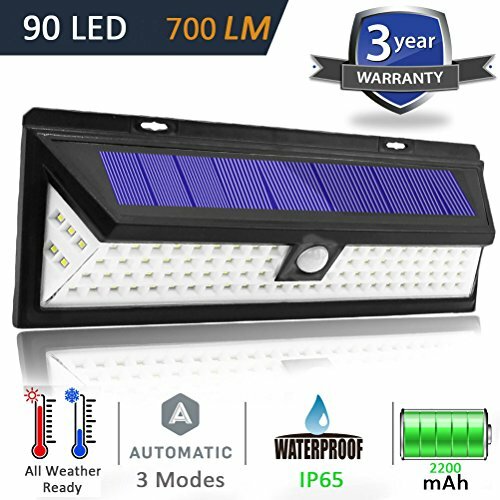 ☀【UNIQUE WIDE ANGLE DESIGN】With 3LEDs setup on both sides of the solar lights which create a wider range of luminosity. The maximum lighting angle can reach 270 degrees. ☀【EASY INSTALLATION】No annoying wires or adapters needed,Only using the included screws to fix the wireless solar wall lights on the wall,Find a place with sufficient sunshine,Without any wires. ☂【WATERPROOF IP65 AND Heatproof】 LECLSTAR Solar Outdoor Lights is water resistant, heat-resistant and frost resistant, It can withstand rain and other extreme weather conditions.Great outdoor security night light for wall, patio, garden, porch, lawn, pathway, stairway, driveway, etc. ☀【ULTRA-BRIGHT-SENSITIVITY】High Sensitivity Motion Sensor and 90 powerful LED,The light feature motion sensors with 120-degree sensing angle and a longer sensing range of 10-26 feet, With 1800mah rechargeable lithium-ion battery,Always ensures you'll never be left in the dark. If you have any questions about this product by LECLSTAR, contact us by completing and submitting the form below. If you are looking for a specif part number, please include it with your message.